I want to read Catching Jordan! 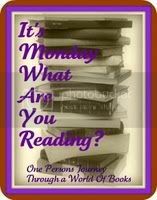 Your reads thsi week are two really popular books. I hope you enjoy them! I'd like to invite you to sign up for my February Giveaway! Win All Kinds of Kisses or a $25 Amazon gift card! Seeing a lot of Graffiti Moon today! Hope you enjoy it along with the rest of your reads! I caught the flu on Wednesday. I spent much of the weekend in bed reading. Please come see what I've read.